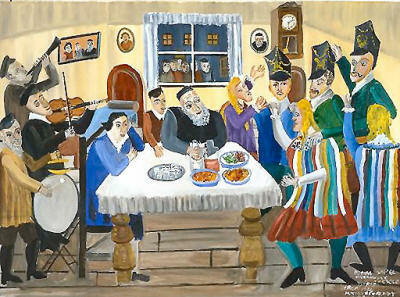 Mayer Kirshenblatt left his hometown of Opatów, Poland in 1934 at the age of seventeen for a new life in Canada. With him he not only brought some of his physical possessions, but also a storehouse of memories that he would carry with him bittersweetly for many decades to come. Thanks to his daughter Barbara Kirshenblatt-Gimblett and his wife, both of whom urged him to put to canvas what he remembered, Mayer took up painting in 1990, and to date has created at least three hundred paintings, each one a memory of life in a town that once contained thousands of Jews and that he called "home." In this exhibition, we will hear from Mayer and see some of his works that have to do with the sacred day of Shabbat, as well as a number of Jewish holidays. By seeing a number of his paintings and by hearing his story in his own words, a picture is painted for us of what life was like in Opatów for the Jews who once lived there. Mayer says that "every Jewish town is the same," so perhaps we wouldn't be taking liberties to imagine that our families, our ancestors who also lived in a town populated with thousands of Jews, might have very well lived in a town just like this one. You may click on the link for any of the Holidays below, or you may follow the "next ►►" links at the bottom of each page, beginning with those for Shabbat, to see the entire exhibition. Collection of Barbara Kirshenblatt-Gimblett and Max Gimblett, New York. Photographed by Tom Warren, with the assistance of Anthony Fodero. Related exhibitions: "Paint What You Remember: The Memories of Mayer Kirshenblatt." "Paint What You Remember," a film preview within the Museum's Screening Room.